Interesting weather again this week. We had to wear warm jackets and rain gear on Tuesday because we were out harvesting most of the day. I finally moved into the shop to finish bundling the herbs in the late afternoon, as my hands were stiffening up from the cold. Barb and I were talking today about the fact that we have hardly had any bugs this year, with the exception of the dreaded flea beetle and, of course, the grasshoppers. We usually have to contend with aphids, especially on the kale and tomatoes. Not this year! Of course, we are so happy about that, as it sure saves us time because we don’t have to spray the natural botanicals and soaps that we usually use. Still disappointed in the tomato production, but they are coming along. We harvested some beautiful heirloom slicers this week. Saturday and Sundays are the days that I work alone in the garden. I don’t have to be on any kind of a schedule, or direct my helpers. I have the opportunity then to really enjoy the sights, sounds and fragrance of what nature has gifted me in this little sanctuary of Kate’s Garden. I feel at peace. As I was picking the first of the Italian Romano beans (pictured above), I was taken back to a time in my childhood when my Grandfather and I were in his garden picking his Italian beans that were from seed that he had brought back from his homeland in Italy. It was a very special memory…a much simpler time. Our family was close and our gatherings always centered around food. We were always cooking, eating, drinking homemade wine and experiencing lively conversations. Food brought us together in a tight, loving unit. I miss those times. This is why I continue to share my love of gardening and food with you. It is my hope that on some level you will experience a sense of peace and fulfillment when enjoying your CSA share. After all, when food is grown and shared with love, it is bound to have a positive benefit on your physical as well as your spiritual well-being. 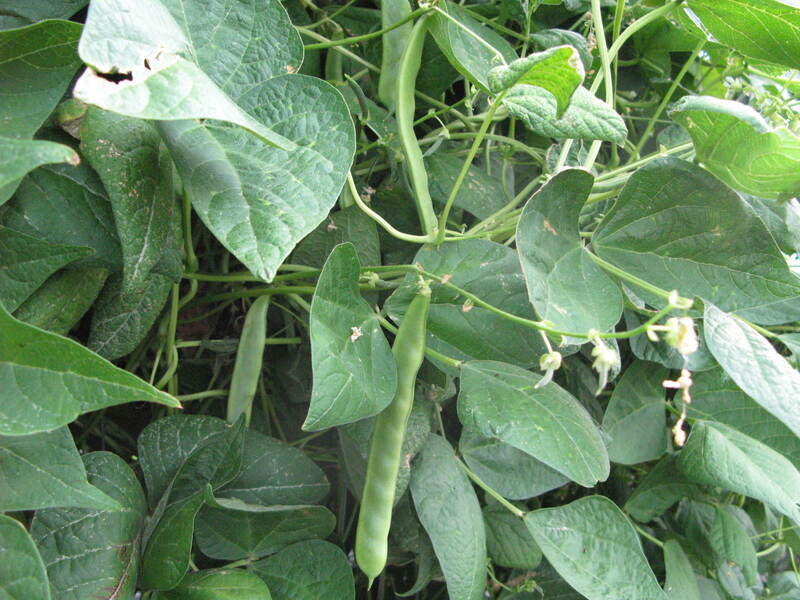 There were only a small handful of the Romano beans to harvest this week, but you will be getting some soon. 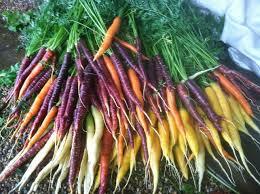 In the meantime we harvested colored carrots that will be in your share this week, along with more golden and green zucchinis, broccoli, bunching onions, cucumbers, kale, braising greens, heirloom tomatoes and herbs. Roast the carrots until just tender but slightly crunchy at 375F for 15-18 minutes. In a small bowl, whisk together the remaining ingredients. Toss with the cooked carrots. The magic of Ponzu is possible in your own kitchen – Fresh is the secret; don’t settle for the bottled stuff. 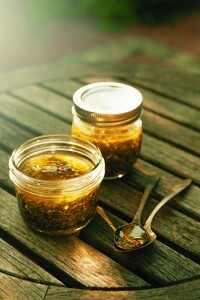 Ponzu sauce is great with all kinds of fish, seafood, meats, and vegetables too. It’s also used as a dipping sauce for appetizers and such – Your imagination is your limit. Zest your orange (this is most easily and effectively done with a Micro-Plane grater – if you’ve not discovered how great these are, you must get one!) – Now juice it. You need ¼ cup; make a screwdriver with the rest. Put orange juice, zest, sake, sugar, soy sauce, lime juice, and cayenne into a saucepan. Bring to a boil, turn down heat to a simmer, and reduce sauce by half for about 3 minutes. Mix together the water and corn starch, add to the simmering sauce, and stir until thickened. Allow to cook for another minute or two, add sesame oil and stir. …and don’t throw away those carrot tops. Make a delicious, versatile salsa with it! You can use it as a dip for veggies, chips and bread, a marinade for meats and veggies, or a drizzle for omelets or roasts. Add all of the ingredients to a bowl and stir to combine. You can adjust the oil to make it a thinner or chunkier sauce. Cover and let stand at room temperature overnight while the flavors intermingle. This salsa only gets better with age, so you’ll know when it’s good when the tops have turned a muted shade of army green. Decant the salsa into a jar and refrigerate. The oil may congeal in the cold temperature, but it will not affect the flavor. Bring to room temperature before serving. Until next week, enjoy your CSA share! And don’t forget to bring back those clamshells for recycling. I can always use them.